Cowboys’ Down-Roster Battles: Who Will Be The Last Quarterback To Make The Roster? The first place to look if you are thinking about Cowboys’ roster battles is our own 2017 Dallas Cowboys Interactive Roster Builder. This handy tool is kept up to date by OCC, and is well worth the visit because it shows that roster battles aren’t always within position groups, but across groups. For example, keeping a third quarterback or a tenth or eleventh defensive lineman means going light somewhere else. We also know that roster churn is a year round business, so there are likely to be some new names by training camp, and potentially even after final cut down day. With that caveat, let’s begin. These are the players currently on the roster. We’ll lead with the locks, followed by the probables, then get to the fight for the last spot. Dak Prescott. What a difference a year makes! Was Dak Prescott even a “lock” last year at this time? He was technically battling for a third-string role with Jameill Showers, who had spent the previous season on the practice squad. Anyone remember this post from last year, after Kellen Moore got hurt, when there was an actual debate over whether the Cowboys should have Showers or Prescott be the primary backup to Tony Romo? (For the record, Showers got 62% of the vote for the primary backup spot over Prescott’s 38%). From that moment on, Dak Prescott seized his opportunity, and totally transformed the Dallas Cowboys’ prospects going forward. Here’s my final Dak and Zeke Report from last year. It links to each weekly report, which may be one of the best ways to recount Dak’s amazing season. You can also read my case for why he’s the NFL’s most valuable player. 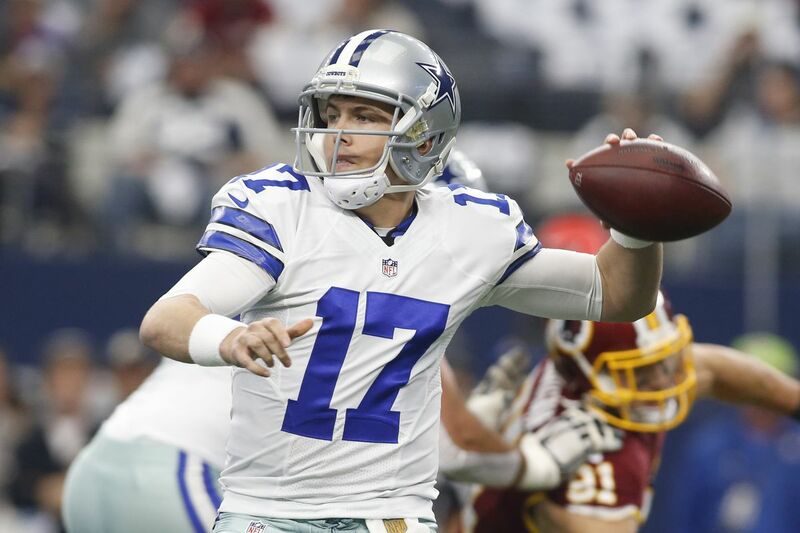 Kellen Moore. While many have doubts about Mr. Moore as the Cowboys’ primary backup quarterback, it doesn’t appear the people who count – Scott Linehan and Jason Garrett – share those doubts. He’s on a one-year, $775,000 contract, which is actually $140,000 more than Dak Prescott’s contract this year. Together, they make a whopping $1,410,000 this season (though Dak will likely earn an NFL bonus again this year). It is theoretically possible that Moore could be unseated by one of the two quarterbacks below, but it’s highly unlikely. There are no probables, as Moore is really a lock. Will the Cowboys carry a third quarterback on the 53-man roster? Not likely. These are the two candidates. Cooper Rush. Our own Tom Ryle has Cooper Rush as his pet cat, so let’s see what Tom has to say about him. It’s time for the Cowboys to correct the missed opportunity they had last season. I’m referring, of course, to how they tried to find the backup quarterback of the future, but overshot the mark and got their starter in Dak Prescott. Now, UDFA Cooper Rush has a chance to do the nearly impossible: Get Scott Linehan to move on from Kellen Moore as the QB2. Moore is regularly praised by the staff and Prescott for being like an extra coach or offensive coordinator on the sideline. That’s all great, but the idea of the backup quarterback is for them to play competently on the field. Moore has had limited opportunities, and really hasn’t displayed any particularly convincing ability. And there is no getting around the fact he is listed (perhaps generously) as being 6-0 and 200 lbs, which is just kinda small for a quarterback, especially if they are not exceptionally mobile. Rush has a much more typical size for an NFL passer at 6-3 and 228 lbs. Otherwise, he is described almost exactly like Moore, right down to the suspect arm strength. For a team that probably needs to upgrade at QB2, Rush offers a better version of what they have already. He may be fated for the practice squad, at least his rookie year, but that would be a win for now and allow him to come back and fight for the job next season. Zac Dysert. Dysert was snapped up by the Cowboys as soon as he was cut by Arizona in June. He’s bounced around practice squads since he was drafted by Denver in the seventh round in 2013. Because he’s been in the NFL for three years, he isn’t eligible for a practice squad spot any more. Likely just a camp arm, but one with more experience. This is one of the easier roster areas to predict. The Cowboys have alternated between keeping three or two quarterbacks the last four years. When they kept three, it was because they were trying to groom a young backup. There’s much less need for that now. Expect the Cowboys to only keep two QBs to spend the roster spot elsewhere.